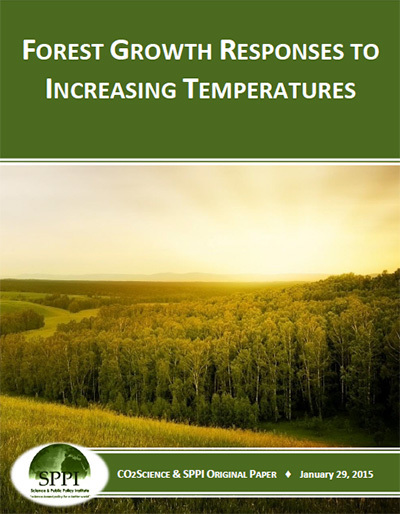 It has been claimed that CO2-induced global warming will be so great and so rapid that many of Earth’s trees will not be able to migrate towards cooler regions (poleward in latitude or upward in altitude) rapidly enough to avoid extinction (Woodwell, 1989; Overpeck et al., 1991; Dobson, 1992; Root and Schneider, 1993; Dyer, 1995). This prediction is based on the assumption that tree growth rates rise from zero at the cold limit of their natural ranges (their northern boundaries in the Northern Hemisphere) to a broad maximum, after which they decline to zero at the warm limits of their natural ranges (their southern boundaries in the Northern Hemisphere). Loehle (1998)1, however, convincingly demonstrated that this assumption is only half correct: it properly describes tree growth dynamics near a Northern Hemispheric forest’s northern boundary; but it is an inaccurate representation of tree growth dynamics near such a forest’s southern boundary.